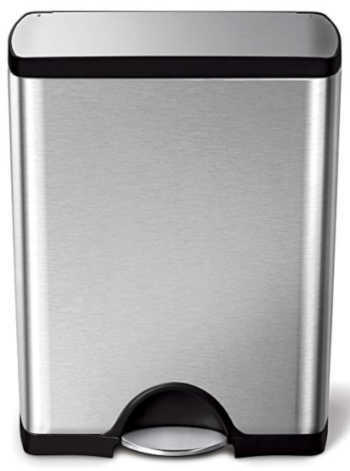 The Simplehuman Rectangular Step Can is a durable stainless steel waste can that will make a lovely addition to any kitchen or office. Conveniently, its lid opens by stepping on a platform pedal. Instead of then slamming shut, the lid will close slowly and quietly thanks to its air suspension shocks. A completely flat hinge allows the can to fit flush against a wall and its nonskid base keeps it sturdy. The product has a fingerprint-proof finish that keeps the steel looking shiny and new and will decrease smudges. Inside the can you will find a dent-proof plastic inner bucker and a smartbucket bag-change system that eliminates messy bag overhang. The Simplehuman Rectangular Step Can has received a lot of positive feedback from its customers at Amazon.com and is currently rated 4.7 stars (at the time of this writing) with 170 answered questions, many with multiple replies. Who would have thought that there could be so much positive feedback made for a trashcan? We have been pleasantly surprised with the findings of our research into the feedback for the Simplehuman Rectangular Step Can. While most of the reviews have been exceptionally positive, there have also been some criticisms leveled at the product, which we will now discuss. One complaint made by a customer was made in regard to the trashcan’s latch that holds the lid open. This reviewer reported that it can be difficult to work with. He argued that the user has to force the lid open as far as possible in order to access the latch. While most of the customers haven’t found this to be an issue, you might want to keep it in mind if you are planning to purchase the product. Another criticism put forward by a customer was aimed at the bin’s foot pedal. Apparently if you depress the foot pedal too quickly then the lid will open forcefully and slam into whatever is behind it. Like the previous complaint, most of the reviewers have not experienced such an issue. One final negative review was made by a customer who described that his trashcan had a faint “plasticky” smell when he first obtained the product. That’s pretty much it in terms of negative feedback for the trashcan. Most of the customers have been satisfied with their purchase of the Simplehuman Rectangular Step Can and the reviews reflect this. The reviewers have left a lot of positive feedback in regard to the trashcan’s design. For example, even though it is just a trashcan, the customers really appreciate its beautiful appearance. They like its color and have found that it adds a touch of class to their kitchen. Its sturdy and high-quality construction has also pleased many. It is sturdy enough that kids will not be able to knock it over and its design also keeps the garbage smell inside the can while keeping ants out. Further, the size of the can has impressed the customers. They have found that it has a large capacity without taking up too much room and can be put flush against a wall. The mechanics of the product have received a lot of positive comments. The reviewers really like how the lid closes slowly without making any noise. Another benefit is that children will be unable to pry the lid open without using the foot pedal because the lid is sealed within the casing. Finally, compliments have also been made for the fact that it doesn’t show fingerprints, that it is easily cleaned, and that removing the bag is simple. Would we recommend the Simplehuman Rectangular Step Can to our readers? Yes, and here is why … you might not think you need to spend this much money on a trashcan. In fact, many of the customers once thought this, but they have since been satisfied by the high level of quality that is represented by the product, and have argued that it is “worth every penny”. Others have said that there is no better-designed trashcan available at this price on the market. We would recommend this product to anyone who is looking for an elegant and sophisticated solution to a common problem. Find the Simplehuman Rectangular Step Can on Amazon to find more information to help you make an informed decision.